Lung cancer is a major cause of cancer-related deaths in men and women. 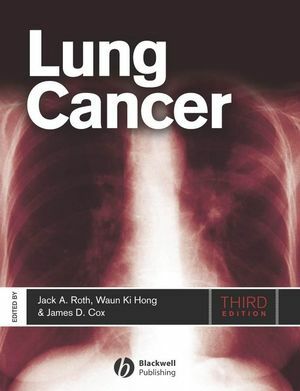 However, since the first edition of Lung Cancer was published 14 years ago, rapid progress in the biology, prevention, diagnosis, and treatment of the disease has been made. Jack A. Roth, MD FACS, Professor and Chairman, Bud Johnson Clinical Distinguished Chair, The University of Texas M.D. Anderson Cancer Center, Department of Thoracic & Cardiovascular Surgery and Professor of Molecular and Cellular Oncology, Director, W.M. Keck Center for Cancer Gene Therapy, Houston, Texas, USA. James D. Cox, MD, Professor and Head, Division of Radiation Oncology, The University of Texas M.D. Anderson Cancer Center, Houston, Texas, USA. Waun Ki Hong, MD, American Cancer Society Clinical Research Professor, Charles A. LeMistre Distinguished Chair in Thoracic Oncology and Professor and Chairman, Department of Thoracic/Head and Neck Medical Oncology, The University of Texas M.D. Anderson Cancer Center, Houston, Texas, USA. 1 Smoking Cessation: Alexander V. Prokhorov (The University of Texas M.D. Anderson Cancer Center), Kentya H. Ford (The University of Texas M.D. Anderson Cancer Center) and Karen Suchanek Hudmon (Purdue University School of Pharmacy & Pharmaceutical Sciences). 2 Lung Cancer Susceptibility Genes: Joan E. Bailey-Wilson (National Human Genome Research Institute, Baltimore). 3 Lung Cancer Susceptibility and Risk Assessment Models: Xifeng Wu (The University of Texas M.D. Anderson Cancer Center), Hushan Yang, Jie Lin (National Cancer Center, Goyang), and Margaret R. Spitz (The University of Texas M.D. Anderson Cancer Center). 4 The Molecular Genetics of Lung Cancer: David S. Shames (The University of Texas Southwestern Medical Center), Mitsuo Sato (The University of Texas Southwestern Medical Center), and John D. Minna (The University of Texas Southwestern Medical Center). 5 Molecular Biology of Preneoplastic Lesions of the Lung: Ignacio I. Wistuba (The University of Texas M.D. Anderson Cancer Center) and Adi F. Gazdar (The University of Texas Southwestern Medical Center). 6 Detection of Preneoplastic Lesions: Stephen Lam (University of British Columbia). 7 Treatment of Preneoplastic Lesions of the Lung: Annette McWilliams (University of British Columbia). 8 The Pathology and Pathogenesis of Peripheral Lung Adenocarcinoma Including Bronchioloalveolar Carcinoma: Wilbur A. Franklin (University of Colorado Health Sciences Center). 9 Treatment of Bronchioloalveolar Carcinoma: Ji-Youn Han (National Cancer Center, Goyang), Dae Ho Lee (University of Ulsan and Asan Medical Center, Seoul), and Jin Soo Lee (National Cancer Center, Goyang). 10 Molecular Profiling for Early Detection and Prediction of Response in Lung Cancer: Jacob M. Kaufman (Vanderbilt University School of Medicine) and David P. Carbone (Vanderbilt-Ingram Cancer Center). 11 The Role for Mediastinoscopy in the Staging of Nonsmall Cell Lung Cancer: Carolyn E. Reed (Medical University of South Carolina). 12 Minimally Invasive Surgery for Lung Cancer: Michael Kent (Beth Israel Deaconess Medical Center,Boston), Miguel Alvelo-Rivera (University of Pittsburgh Medical Center), and James Luketich (University of Pittsburgh Medical Center). 13 Extended Resections for Lung Cancer: Philippe G. Dartevelle (Paris Sud University), Bedrettin Yildizeli (Marmara University Hospital, Istanbul), and Sacha Mussot (Hôpital Marie Lannelongue – Le Plessis Robinson). 14 Adjuvant Chemotherapy Following Surgery for Lung Cancer: Benjamin Besse (Institut Gustave Roussy, Villejuif) and Thierry Le Chevalier (Institut Gustave Roussy, Villejuif). 15 Induction Chemotherapy for Resectable Lung Cancer: Katherine M.W. Pisters (The University of Texas M.D. Anderson Cancer Center). 16 Image-Guided Radiation Therapy: Kenneth E. Rosenzweig (Memorial Sloan–Kettering Cancer Center) and Sonal Sura (Radiation Oncology Resident, New York City). 17 Stereotactic Body Radiation Therapy for Lung Cancer: Robert D. Timmerman (The University of Texas Southwestern Medical Center) and Brian D. Kavanagh (University of Colorado Comprehensive Cancer Center). 18 Proton Therapy: Joe Y. Chang (The University of Texas M. D. Anderson Cancer Center), Alfred R. Smith (The University of Texas M.D. Anderson Proton Therapy Center), and James D. Cox (The University of Texas M.D. Anderson Cancer Center). 19 Combinations of Radiation Therapy and Chemotherapy for Nonsmall Cell Lung Carcinoma: Zhongxing Liao (The University of Texas M.D. Anderson Cancer Center), Frank V. Fossella (The University of Texas M.D. Anderson Cancer Center), and Ritsuko Komaki (The University of Texas M.D. Anderson Cancer Center). 20 New Chemotherapeutic Agents in Lung Cancer: Anne S. Tsao (The University of Texas M.D. Anderson Cancer Center). 21 Immunologic Approaches to Lung Cancer Therapy: Jay M. Lee (David Geffen School of Medicine at UCLA), Steven M. Dubinett (David Geffen School of Medicine at UCLA), and Sherven Sharma (David Geffen School of Medicine at UCLA). 22 Epidermal Growth Factor Receptor Inhibitors: Lecia V. Sequist (Harvard Medical School) and Thomas J. Lynch (Massachusetts General Hospital). 23 Tumor Angiogenesis: Biology and Therapeutic Implications for Lung Cancer: Emer O. Hanrahan (The University of Texas M.D. Anderson Cancer Center), Monique Nilsson (The University of Texas M.D. Anderson Cancer Center), and John V. Heymach (The University of Texas M.D. Anderson Cancer Center). 24 Retinoids and Rexinoids in Lung Cancer Prevention and Treatment: Nishin Bhadkamkar (Emory University School of Medicine) and Fadlo R. Khuri (Emory University). 25 Proteasome Inhibition in Nonsmall Cell Lung Cancer Therapy: Minh Huynh (Kaiser Permanente Walnut Creek Medical Center) and Primo N. Lara Jr (University of California Davis Cancer Center, Sacramento). 26 Targeted Genetic Therapy for Lung Cancer: Jack Roth (The University of Texas M.D. Anderson Cancer Center). 27 Screening for Early Detection: James L. Mulshine (Rush University Medical Center). 28 Natural Agents for Chemoprevention of Lung Cancer: Amir Sharafkhaneh (Baylor College, Houston), Suryakanta Velamuri (Baylor College, Houston), Seyed Javad Moghaddam (The University of Texas M.D. Anderson Cancer Center),. Vladimir Badmaev (Sabinsa Pharmaceutical, Inc., New Jersey), Burton Dickey (The University of Texas M.D. Anderson Cancer Center), and Jonathan Kurie (The University of Texas M.D. Anderson Cancer Center).